In our fast-paced, modern world, we have sadly come to expect daily anxiety and stress as normal, something we all have to “just deal with.” For those with chronic anxiety, the feeling of being on edge, worried or overwhelmed can begin to seem so constant that it’s impossible to change. Worry no longer! This presentation will be helpful both for those who are anxious and stressed, and also those who have a loved one with anxiety issues. It will focus on explaining what anxiety is, how it works in our brain and our body, how we can support those who experience anxiety, and how we can free ourselves from the downward spiral. With the right combination of information and practical advice, you will leave this talk with a greater understanding of what anxiety is, how it impacts our lives, and how to master it…and how to fill your life with joy, peace, and calm. A light dinner will be served, and a goodwill offering will be taken. Reservations are required for the meal only. Sign up in the church office or email Sue Dale. Our speaker is Matthew Swartz, MSSW, LMSW, who is fiercely passionate about helping people to understand themselves, how to grow, and how to build their lives. Matt is the Assistant Director of Clinical Services at PCS-Counseling, where he has been in private practice for five years. He specializes in Anxiety, High Performers, ADHD, and Traumatic Grief. Matt received his graduate degree from Columbia University in New York City, where he also lived and worked for five years. 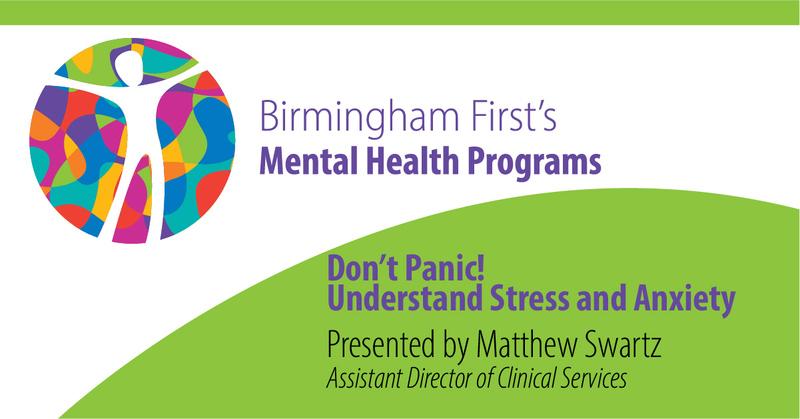 Birmingham First and Mental Health: Seeking to break the silence and stigma through sermons, program offerings and resources.